We have a large selection of Wedding Products at NightclubShopand cater to many Wedding Planners, Bridal Parties, Private weddings, and Event Planners as well asCompanies. Have our Graphic Arts Team send you a Proof with your Art or LOGO on the LED Foam Sticks and see what great results they can bring for establishing a strong presence at your next Event! Wedding Details are Very important on your special day. Call in anytime, and once any of your custom orders have been placed, you will have a Graphic Designer assigned to your order from the beginningall the way until that special day! We can Design, Edit, and help make your image design a reality as well as send you proof after proof until your desired design is perfect! 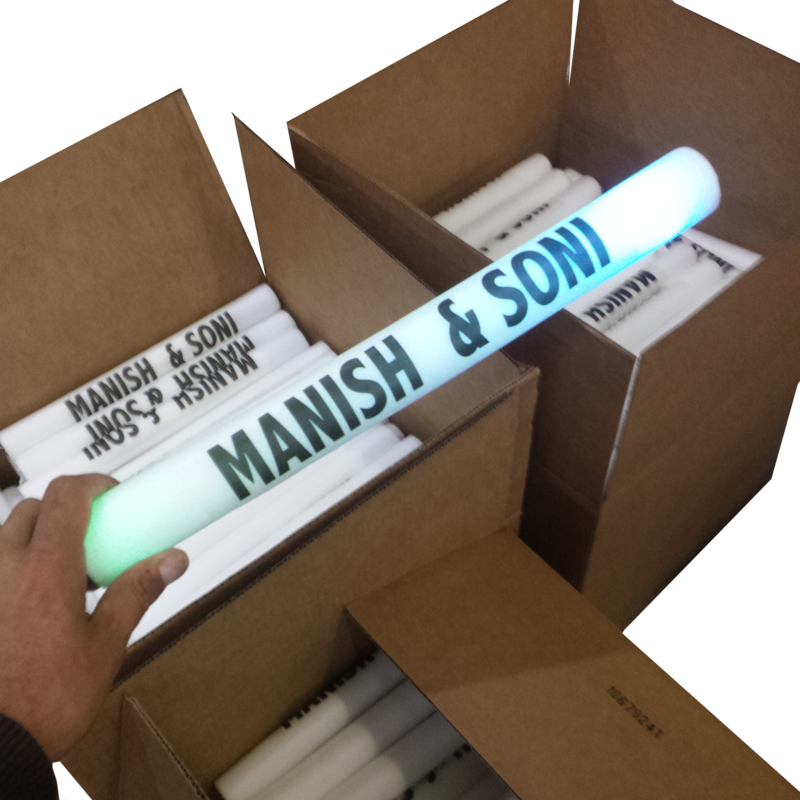 Our 16" and 18" LED FOAM STICKS are Customized and Printedinhouse by our team. Custom Printed with your Text, Logo, or Art. 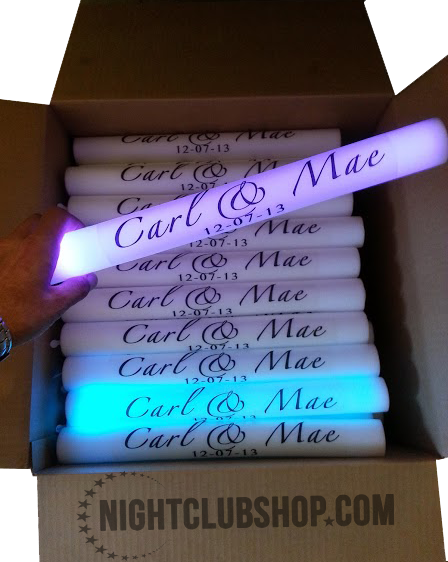 These 16 Inch customizable Foam Sticks are great party favors for any wedding. Give your guests a cool and memorable gift that is very inexpensive and something that they can take home as a wedding keepsake. No need to overthink your choice of a party favor because these foamsticks are guaranteed to satisfy each of your guests and leave a lasting impression. AREA TO USE IS 2 X 4 INCHES. JUST ADDED CUSTOMIZE YOUR FOAM STICKS FOR ANY PARTY. I purchased these for my upcoming wedding and they look AMAZING! So excited for my guests to be able to take home this fun favor! I looked at a lot of websites and found that this was by far the easiest most cost efficient. Although my wedding isn't until 8/15. I anticipate these foam sticks to be a smash hit for my guests, the video and pictures! Glad I went with my gut instinct. This company was fast and easy to work with. High recommend! No regrets. Hands down. Thank you Night Club Shop! Great quality and fast service. I know they will enjoy them!